Before I jump into more details about technical analysis, I would like to recommend the stock charting software that I'm currently using right now. There are tons of stock chart provider or charting software out there today. Some are free and some charge you a fee. Those that are free will have a premium version that provides more feature. You will need to pay for those extra features. When it comes to the trading strategies in this website, I highly recommend Freestockcharts.com. That in my opinion is the best stock chart provider for swing trading which is the main staple of what I do. Freesstockcharts.com is a free charting software that you can use to create charts. If you are using a browser to access this site, you will need to use Mozilla Firefox or Internet Explorer as their software uses Microsoft Silverlight which you need to download separately. You can also download their workstation so you can access from your desktop. 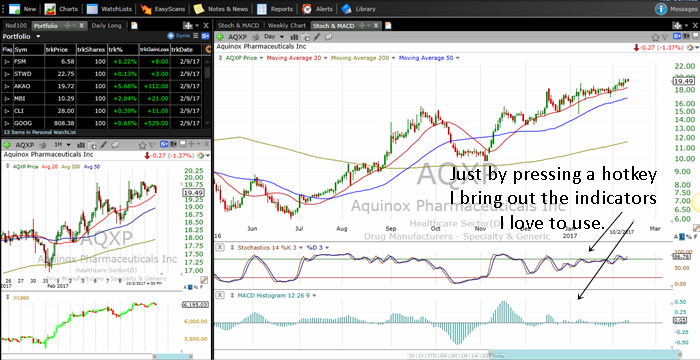 If you plan on using the trading strategies on this site, you will benefit tremendously from using this stock charting software as its super easy to do scans and analysis using this software. I have tried others such as stockcharts.com but I found it to be a bit slow and cumbersome for me. When you are swing trading or momentum trading or investing, you do not need all the complicated stuff required for day trading. Below is how I setup my charting software. That's all in one screen and therefore you can work using only a laptop. The main window is my primary daily chart which I use to find trading candidates. One of the things you will discover when analyzing stocks is to constantly zoom in and out of stock charts. 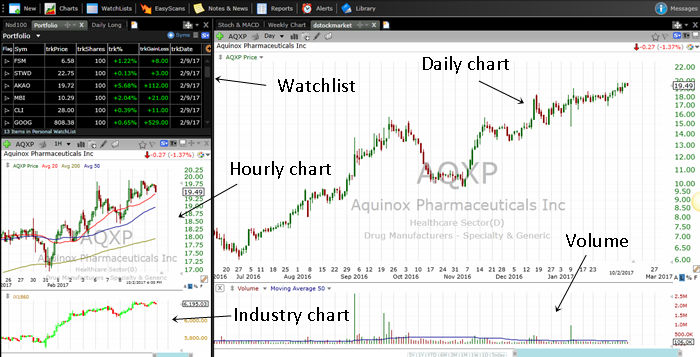 Its a bit difficult with other chart providers but Freestockcharts allows me to zoom in and out of charts easily through the wheel on my mouse. As a swing trader or investor you need to look at 3 time frames constantly. The daily chart, the weekly chart and 60 min chart. I can easily switch between time frames quickly by pressing short cut keys 1,5 and ctrl + 6. You can also change chart styles and bring up indicators quickly by assigning F1 to F12 to these charts. For example if I want to see the stochastics and MACD I just press F6 and the chart containing these indicators will appear. There are other chart provider like stockcharts.com and tradingview.com. The most important is to find one that suits you but in my opinion I still think that freestockcharts.com is the best for swing trading and investing.